My throat is raw and my body aches. This awful feeling is probably partially the result of lack of sleep from the adrenaline rush of starting the thumbnail sketch phase of Badin and the Secret of the Saami. Yep. I'm sick (in more ways than one possibly)! This morning I went to bed at 6:30 in the morning. I really need to re-assess my priorities. 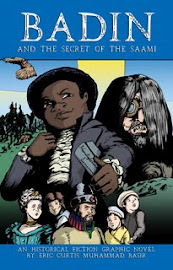 When I wrote earlier that this graphic novel, its characters and the 18th century Sweden is beginning to possess my soul, I was not exaggerating. Script with panel direction (top left). This gives me the feel of the layout with each panel (frame) on the page and its dialog, sound effects and general composition. The black construction paper shapes are a critical positive/negative space ingredient to helping me maintain randomness in the thumbnail sketches (I did not include white shapes on black paper in the photo). Thumbnail sketches are not little drawings. They must contain gestures of lines and contrast. Badin and the Secret of the Saami is full of literal and visual contrasts. From these thumbnails I will create pencil artwork (when I'm done with all four acts). The sketch pad is where I work out the black construction paper and scribble general compositions before gesturing them into the layout pages on the bottom row. I often drop shapes at random on the page and build them up from there with minor adjustments until I see an object or person. I got this idea from retired Chicago Public Schools high school art instructor Diane Towber. She is an excellent abstract painter and clothing designer. The thumbnail layout pages are proportionally shrunk from 11x17" to 8.5x10" to fit on scrap paper. I use scrap paper because I will feel less committed to the panels and more confident about trying new ideas. Of course, when I do the pencil and ink phases, I will use the full size. By the way I plan to do pencil phase of the first act entirely on Bristol board. 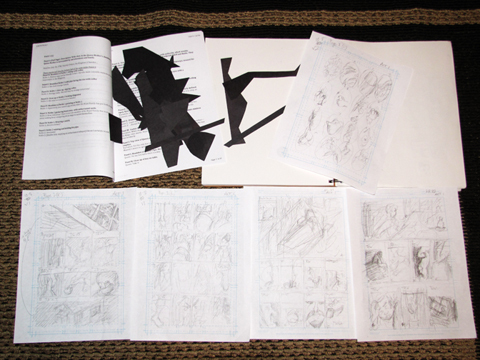 By the way, I used Doug Hills' Manga Studio 5EX comic page templates for these thumbnail layout sheets. The thumbnail layouts and script are obscured in this low resolution image for obvious reasons. 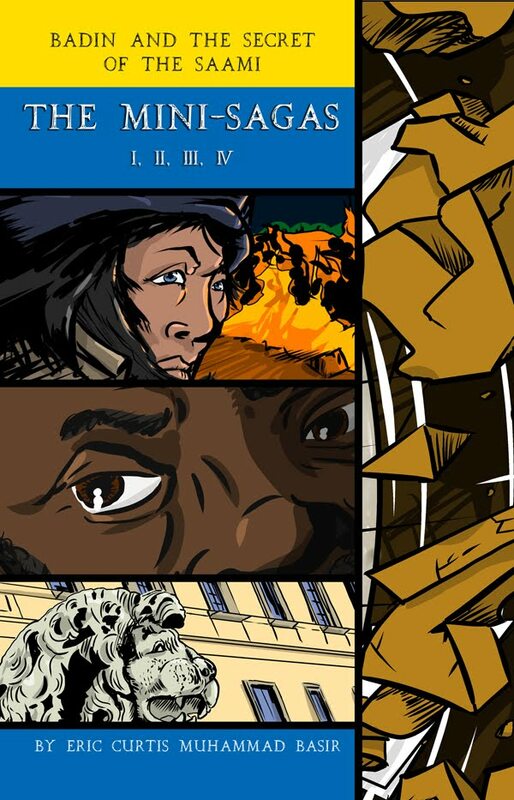 However, I wanted you to learn about the creative process behind creating the graphic novel's illustrations. During this process, I will cut down the amount of blog entries. However, rest assured, I am working hard every day to make this project a reality. 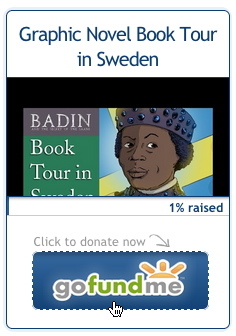 Please comment, share and tell your friends about Badin and the Secret of the Saami. I want you all to buy it when it is finished. It will be a work of art for all ages.